Just ahead of the season finale of HBO’s Westworld this weekend, Warner Bros. Interactive Entertainment has dropped a bot-load of info about their new mobile game tie-in. If you’re into theme park managers, games like Fallout Shelter (see: Behaviour Interactive), or are just obsessed with everything Westworld, you’re going to want to head to the app store of your choice (it’s available on iOS and Android devices). I was intrigued, so I gave the game a download and about an hour of my time. You basically help run the park from behind the scenes, or more accurately, from beneath it. You’re guided by familiar characters throughout the tutorial, get to create hosts that fill specific roles (and include more familiar faces from the TV show), and make sure your guests are appeased. There are a lot of options to play with and things to keep track of, and it’ll keep you playing for a long, long time if you let it. Though there are various currencies used to progress in the game–gold for building, crafting, and creating; gems for speeding things up if you choose to do so–it doesn’t feel as micro-transactiony as it could have. There are, however, tons of ways for you to amp up your experience by using real-world currency to buy cosmetic and gameplay-enhancing items. At first blush, it’s a well-developed game that has a lot of things to love for fans of Westworld, and there’s even some meta messages hidden away within that should delight you as you play. 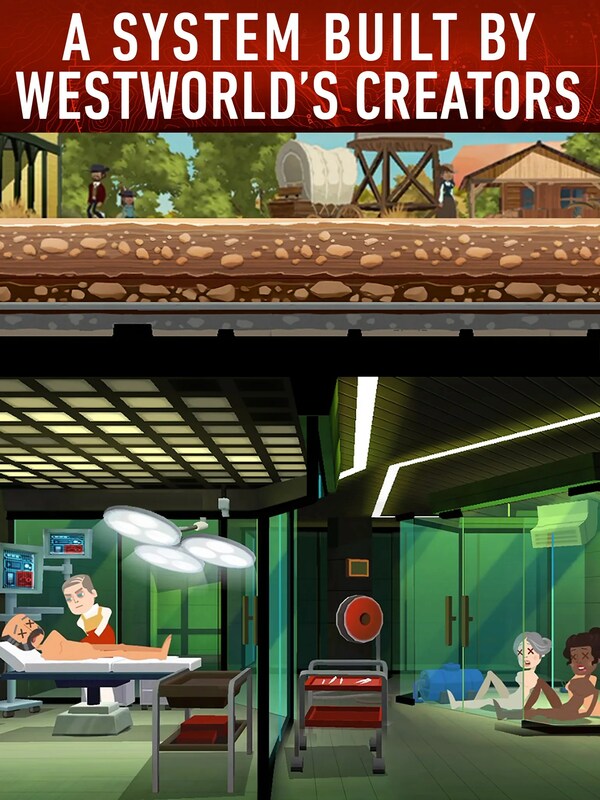 Warner Bros. Interactive Entertainment today announced the launch of Westworld, the innovative mobile simulation game based upon HBO’s most-watched new original series, on the App Store and Google Play. Produced by WB Games San Francisco in collaboration with Kilter Films, creators and producers of the Westworld series, the game is developed by Behaviour Interactive and invites players into the alluring Westworld universe to take on the role of a newly hired Delos employee who is granted access to the Delos Park Training Simulation (DPTS). The Westworld game narrative was written by series writers and features notable characters – including Bernard, Delores, Maeve, and more – to immerse players to the themes that have attracted millions of fans. Players control all aspects of Westworld park operations including manufacturing, managing and upgrading AI-based Hosts as well as satisfying a wide range of Guest desires. The game’s content spans the first season of the series, with additional content from the highly anticipated season two coming online after it appears on the show to avoid potential spoilers. Complementing Westworld’s story is its fresh combination of construction and management elements with roleplaying game (RPG) style character development. Gameplay takes place on two levels: Aboveground, there is the western-themed world visitors experience, with iconic locations and a variety of Hosts. Belowground is the high tech Delos facility where Hosts are manufactured, repaired and upgraded, and new facilities can be brought online to advance park operations. Via a user interface inspired by the tablets technicians use on the series, Westworld players have a deep array of Host features and modifications at their fingertips. As in the series, things don’t always go as planned. Hosts can be eliminated by Guests who are unhappy with their level of service, and the longer Hosts are continuously used, the more they are likely to glitch. However, glitching can be ameliorated by putting Hosts into Critical Analysis for a therapeutic question and answer-based minigame. There’s plenty of fun to be had with colorful, highly stylized graphics and sly humor for both fans of the show and RPG simulation players at its core.